Roger is an ex submariner so our first trip out will be our sea trials! It's planning on raining non stop all day tomorrow and since we are leaving Saturday morning, today is a day of stowing and preparation. First thing in order is I checked our fluids. Oil in the generator and then in our Cummins Desiel. I always check in the Jeep but found the dip stick in CiCi Blue to be extra long. Haha. Fluids, perfect! Then I removed, brushed,folded and put away our wheel covers. Roger is installing our bike rack on the back of the rig which has been a challenge since he has sore shoulders. Let's see, oiled the chains on our bikes so they are all ready to travel. Finding places in the basement and rearranging and pitching. Ha, we haven't even left yet. This is where we will hang the bikes. Where, oh where..... Actually once we get the screen out,(White panel laying in back) we will have lots of room. Hopefully, we can get it rolled back up and stored. Storing things inside and tucking them away for travel will be for tomorrow! Let's hear it for heavy duty velcro!! 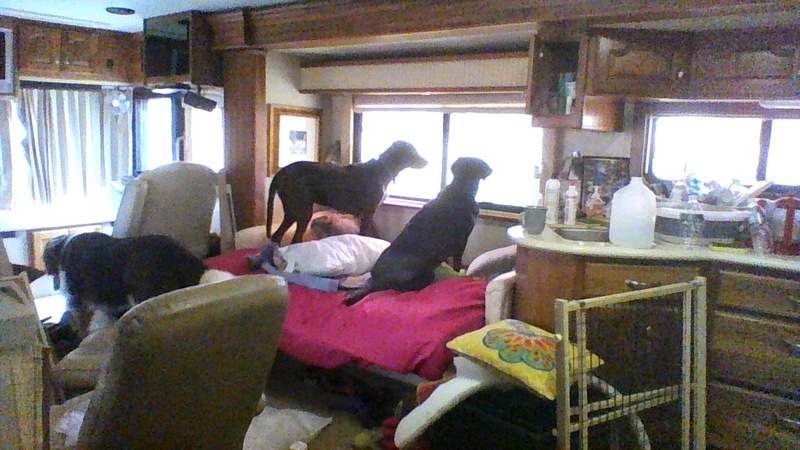 The kids know something is brewing and are supervising from the windows. Have you tried pulling the slides in to verify where everything and everyone will go while you're on the road? I will be driving our jeep for this adventure so two kids will be with me driving and Ozzie will be in the coach. It rained all night here so we are giving everything a chance to dry then we'll pull in the slides to do our stowing check.